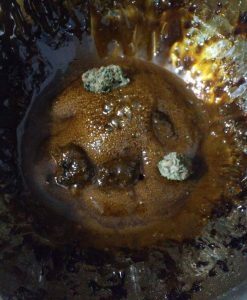 DIY Moonrocks, AKA Caviar Gold! Moonrocks, also known as Caviar Gold, are considered a rare delicacy in the cannabis connoisseur market. These tiny pebbles hold a lot of weight, and come with a price tag to match. In this tutorial we will show you how to make them! Now before we get started, there are some things to consider. First of all, MAKE SURE YOU ARE USING HIGH QUALITY INGREDIENTS! I can’t stress this enough. 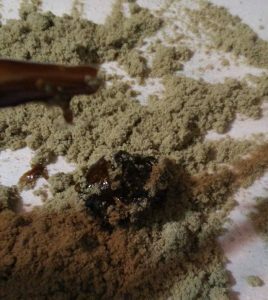 Anything less than top shelf flower, wax or oil, and dry sift will create a subpar product. In the short term this might not seem like a problem if you are trying to make a quick buck, but check game. If you’re making this product to sell (HighWrites does not condone the sales of illegal products, please consult local laws, and do whatever you do at your own risk.) to a club or friends, or for patients, using less than top shelf material will give your clientele a bad taste in their mouths, literally and figuratively, leading to a drop in demand for product, a drop in your sales, and overall loss of profit. When done properly, moonrocks are very heavy, and so when people spend money on them and the high isn’t over the top, they rarely spend money on them again. All right, lets get it. Cannabis Flowers, aka nugs. 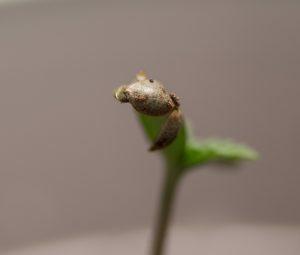 While it is up to you what size you want to make, I find that smaller, ¼ to ½ gram nugs work best. Perfectly cured, won’t crumble easily but dry enough to smoke, nugs work best. If they are too dry they still work, but can break off in the oil and make a mess. If they are too moist, the moisture is locked in and can create mold. 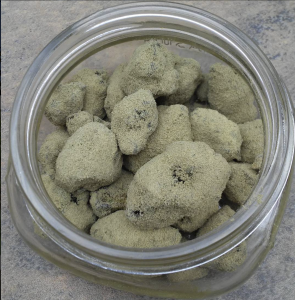 Nobody wants moldy Moonrocks. 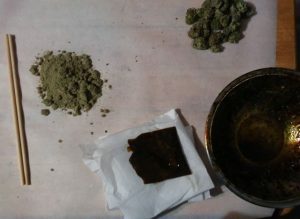 I also prefer denser nugs, as the oil doesn’t soak all the way through, most people want to be able to break it open and see some untouched green in the middle. 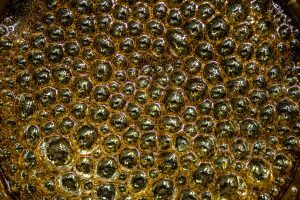 Cannabis oil. 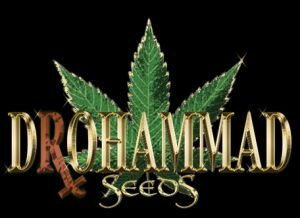 This can be made in any way, heat pressed, BHO, CO2 extraction, quick wash ISO, ect. Just make sure it is fully purged and of good quality! I prefer heat press, because it is solventless and convenient for me, but BHO that has been through a proper vacuum purge is just as tasty, in my honest opinion. One thing that’s nice about moonrocks is that you don’t have the critic judging your oil by how light or clear it is. Those who have used heat extraction know that sometimes the darker stuff is just as good, if not better than the ultra blond. I think it’s because it holds more terpenes. Dry Sift, aka keef. This is where a lot of people mess up their moonrocks. 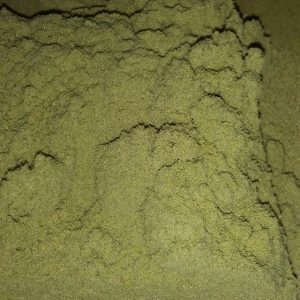 Ground up shake is not keef, nor is the stuff at the bottom of your bag! The keef you use should be sifted through no larger than a 125 micron screen. There are plenty of products on the market for dry sifting, the one I use is called a Tumble Now Rotator, which I bought almost 10 years ago for around $400, but these machines can be made at home for a lot less, perhaps I’ll make one and put up a tutorial in the future! Parchment paper. Not much is needed, just enough to make your self a nice little placemat/work area. I prefer the kind with the grids, only because I use it for rosin pressing too and the lines are nice for keeping my paper size consistent when making cuts. DO NOT USE WAX PAPER! Chopsticks. You can also use stems, or even a large pair of tweezers or prongs. I prefer the sticks because you’re trying to get as little oil rubbed off on your utensil as possible. For me they also give me more control of what I’m doing, but I’m a ninja, I can catch a fly with chopsticks. Stainless Steel Bowl. This is for heating up the oil. You want a small bowl, no bigger than cereal bowl size. You can also use glass, I prefer stainless steel, it’s sturdy, even though we aren’t heating it up to glass shattering temperatures, I’ve had glass break easy before in random situations, stainless steel doesn’t do that. Coffee Mug Warmer. 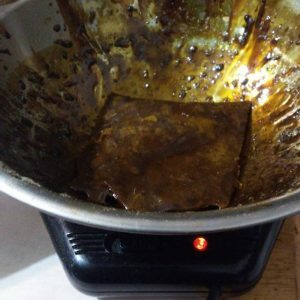 There are other ways to heat up the oil, but this seems to work the best for me, simple setup, doesn’t take much space, and keeps it at a good temperature, not too hot! And that’s it! Time to cook! ​​Step 1: Setup. Lay down a sheet of parchment paper over your area, put your extracted wax/oil/shatter in the bowl and put the bowl on the coffee warmer. You want it to heat up to a nice liquid consistency. Make sure to stir it occasionally, to distribute the heat evenly. 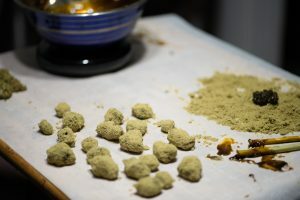 Make a pile of dry sift on your parchment paper, and get your nugs ready for action. Step 2: Once you got your oil nice and hot, drop a nug or two into the oil. Using your chopsticks, roll the nugs around until they are completely coated with the oil. Step 3: Now, lift the nugs out of the oil with the chopsticks and drop them into the pile of keef. Gently push them around in the keef until they are fully coated, so you can’t see any of the oil. I like to drop them on the paper to shake off spots where too much keef might have clumped up, just to make sure they aren’t covering any spots I might have missed. ​​Step 4: Repeat until finished. I like to roll them all in another layer of keef once they have cooled a bit, as the wax settles and leaves some dark spots. Wait until they are fully cooled before putting them in jars. It should also be noted that, like all cannabis products, you do not want to store these in light, or the heat. A cool dark place is best. But especially for moonrocks, as they can melt together in the heat. Finished product, ready to smoke! ​​So there you have it! Next level recipe brought to you by HighWrites! If you have any tips or other methods used while making these I’d love to hear it, Im always trying to gain new knowledge. Leave a comment and let me know how it went for you or if you have any questions. Hope you enjoy!